Aren’t modern smartphones excellent? It’s like having a mini super-computer in your pocket compared to those bulky handsets of old. Technology, on the whole, has been getting better and better every year and – crucially – a good chunk cheaper too. Because of this, you no longer need to hand over wallet-wilting sums of cash for your yearly smartphone upgrade. Move your wallet away from those usual smartphone flagship big-hitters, and you’ll find yourself a fantastically priced bargain with some cracking budget smartphones to be found. Yes, those headline-grabbing flagships such as Samsung’s Galaxy Note 8 and the iPhone 8 are wonderful and all, but we don’t have to spend top-dollar for a great smartphone experience anymore. Would you like to know more? Well, that’s where we come in. These are the best budget smartphones in 2018. Each and every year, Expert Reviews put hundreds of smartphones to the test so you don’t have to, with the best coverage in the UK. Because of this, we can definitively give you a heads up which budget smartphone is perfect for you. Take a look below, and you’ll spot our regularly curated list of the best budget smartphones you can buy in 2018, as well as a helpful budget smartphone buying guide on the second page. Without further adieu, here are the best budget smartphones you need to buy in 2018. Lenovo’s P2 quickly drew high acclaim when it arrived in the Expert Reviews office. The reason? It has the best battery life of any smartphone we’ve tested thus far. Lasting almost 30 hours on a single charge is just absurd, easily besting our previous winner – the Motorola’s Moto Z Play – by five hours. The Lenovo P2 is the budget smartphone to beat. Now, it’s a little chunkier than most, weighing 177g, but it’s a small price to pay for the longest-lasting smartphone on the market. It isn’t just the battery life either, the Lenovo P2’s display, performance and overall build quality are all top-notch, giving those pricier mid-range handsets a run for their money. Your phone budget £200? Get the Lenovo P2; it’s a no-brainer. Alcatel’s Pixi 4 may be the cheapest phone on this list, but don’t let that fool you – It’s a cracking choice. For just £59 – yep, that’s right – you get a 5in touch display, Android Marshmallow and a rear 5-megapixel camera. At that price, you can’t really ask for more, and puts some of those pricier phones to shame. And that’s the best thing about it – it’s the perfect phone as a second device or a first phone for the kids. Sure, its performance is hardly industry leading – and its camera is a bit naff – but for £59 you can’t do much better. Get this if money is tight, and you shouldn’t be disappointed. The Moto G is back and it’s better than ever. It might be significantly larger than last year’s Moto G, but this new model is a huge step forward. With an octa-core Snapdragon 617 chip at its disposal, its speed is streets ahead of every other budget phone you can buy today, giving it as much processing power as phones that are twice the price. It effectively makes every mid-range smartphone of the past six months utterly irrelevant, as you can get exactly the same kind of performance for just £169. Its camera is also a step up over the third-generation Moto G, despite using a similar 13-megapixel sensor, and its huge battery provides plenty of staying power. Throw in a beautiful Full HD resolution screen and you’re absolutely laughing. Samsung has a great track record of pumping out fantastic budget handsets. For the past few years, it’s been the firm’s J-series lineup that has drawn headlines, and this year’s Galaxy J5 is no exception. Not only does the 2017 J5 have a monstrous battery life, buts is Super AMOLED display – despite being only 720p – is a proper beauty. Its colours are so punchy in fact, that it puts other LCD-laden displays to shame. And this year, camera performance has seen a marked upgrade, too. In fact, I’d say it’s even better than the sensor on the Moto G5 – it’s miles apart from last year’s washed-out looking images. Pair that with its eye-catching display, and you’re looking at a phone that’s perfect for showing off your excellent Instagram snaps. The only sticking point is its hefty price hike. Last years would have asked for a measly £150, but we’re expected to pay almost £100 more for this updated version, at £240. Still, that vastly undercuts those pricey flagships, so Samsung’s Galaxy J5 retains a seat on our budget phone hierarchy for another year running. Good show Samsung. 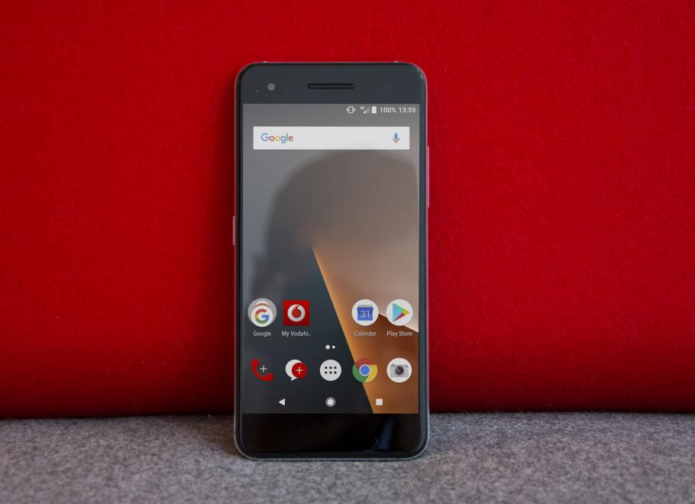 If you thought last year’s Smart Ultra 6 was a little too big for you, then Vodafone’s Smart Prime 7 is the ultra-cheap smartphone you’ve been waiting for. Available for just £75 on Vodafone’s PAYG service, this incredible budget device is a great buy for first-time smartphone owners. Its pre-installed Vodafone apps make it easy to keep track of your data allowance and manage your bill, and you can also set it up to receive calls and texts through your web browser if you have poor signal at home, making it easier than ever to keep up to date with your friends and family. Admittedly, it can’t quite top the second-generation Moto E for best overall value under £100, especially when you can now pick up a Moto E for just £80 SIM-free, but the Smart Prime 7’s design and display are vastly superior to anything the Moto E has to offer. Just be wary that you’ll probably have to buy a microSD card for the Smart Prime 7, since its meagre 8GB of storage fills up astonishingly quickly once you’ve downloaded a couple of apps. Okay, you’re probably thinking: Xiao-who? But don’t let that put you off, just because you might not have heard of Xiaomi doesn’t mean its latest budget handset isn’t worth a mention. The Redmi Note 4X is a superb choice, provided you can find one in the UK that is. And that’s its sticking point, the Xiaomi Redmi Note 4X – along with the rest of the firm’s handsets for that matter – aren’t sold in the UK. Yes, you can pick one up through a grey import seller, like GearBest for example, but you have to factor in extra shipping costs and import tax. That said, Xiaomi’s latest can still be picked up for around £150 all things considered, making it a solid choice for your next budget handset in 2018. I know what you’re thinking: another Vodafone smartphone on this list. Well, it’s no surprise to see the Smart N8 make an appearance here; it’s a massive improvement over last year’s already impressive Smart Prime 7, with a much better camera and a fingerprint reader, too. For the low, low price of just £85, you get a handset that runs Android 7.0 Nougat straight out of the box as well as all those flagship features you’ve come to expect. Its battery life is a tad short – and is surpassed by its older Smart Prime 7 sibling – but performance is decent enough for a phone at this asking price. The Vodafone Smart N8 is so dirt cheap, it’s almost impossible to pass up. Another budget Vodafone phone. This one’s the E8: and it’s dirt cheap at just £50. Like the Alcatel Pixi 4 above, it isn’t so wallet-wilting, but it does have a couple of extra things up its sleeve. For one, it runs Android 7.1 Nougat out of the box, while the Pixi 4 has to contend with the older, 6.0 Marshmallow. Its battery life is a decent improvement, too: at well over 10 hours compared to the Pixi 4’s 8-hour longevity. Both phones are incredibly similar when it comes to all those other aspects mind, performance isn’t the best and the camera leaves a lot to be desired, but for £50 you can’t really do much better. Which smartphone operating system do I need? The operating system you want your phone to run remains the most important choice in a budget handset, as it is in a high-end phone. It’s the OS that defines how the phone is in use, which apps you can install, and the features that come as standard. Apple’s iOS-based smartphones don’t feature on this list, since they’re far more expensive than the competition, leaving your choice between Android and Windows. Both are fully featured and smooth operating systems, but they offer a different user experience and range of handsets. Android is, as we’re sure you’re aware, the world’s most popular smartphone operating system, with around 80% of handsets running it. 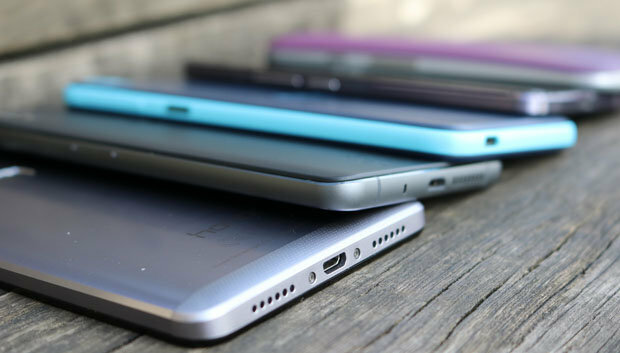 With any manufacturer able to use Android, it means that there’s plenty of choice at various price points. The problem with Android is that there are numerous different versions and some budget handsets don’t – and won’t – run the latest version. For that reason, we recommend a minimum of Android 4.1 (Jelly Bean), since older versions are out-of-date and may not support all of the apps that you want to install. Even when you pick a version of Android, things are slightly complicated by the fact that manufacturers customise their own version of Android, which means that the experience differs. For example, our Android 6 Marshmallow review explains how the latest version works, but the experience differs significantly between manufacturers. Many phones are also still running Android 5.0 Lollipop. 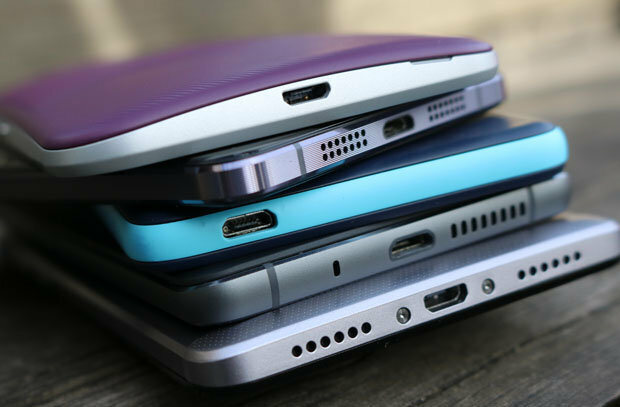 Our phone reviews explain which version a phone has plus how Android behaves on that particular device. Android has tons of apps, all available in the Google Play store, and the number almost matches that available in Apple’s App Store. Android app quality is improving, too, but we’d say that iPhone apps are generally a little bit slicker and of a better quality on the Apple App Store. You should find that most major apps are available on Android, although there are some exceptions that are available only on iOS: this is one compromise that you can’t do anything about if you’re looking for a budget handset. Windows is your second OS choice for a budget handset. This is also available on phones from different manufacturers, but Microsoft, not surprisingly, is the biggest. This means that there are fewer handsets to choose from than with Android, but don’t let that put you off; Windows Phone is a highly accomplished OS, which is incredibly smooth and intuitive to use. We love its Live Tiles, which are large icons that display information from apps, such as your latest calendar appointments. New Windows phones should now come with Windows 10 Mobile, but older handsets (such as the Lumia 640) will still ship with Windows Phone 8.1. There isn’t a huge difference between them, at least in terms of appearance, but Windows 10 is much neater and tidier overall. As easy as it is to use, Windows Phone’s biggest issue is that its app store is small and you don’t get every app for it. If you download and install numerous apps, or have a particular app in mind, Android is going to be the better OS. What should I look for in a smartphone display? A budget smartphone is controlled entirely through its display, so it’s important to get one that’s right for you. While flagship phones will have the best screens and the highest resolutions, you can still find budget smartphones with high-quality displays. For a very cheap handset, we recommend a minimum resolution of 960 x 540, but look for 1,280 x 720 or 1,920 x 1,080 if you want a sharper-looking screen. Nearly all of the budget smartphones we recommend use LCD panel technology, which is more than good enough, but we’re now starting to see Super AMOLED displays crop up at the lower end of the scale as well, which produce even better colours and much deeper blacks. Read our full reviews if you want to know full details of how good the screens are. A budget smartphone means that you’ll get a slower processor than with a flagship model, but that doesn’t mean you should compromise too far. Make sure that you get a relatively quick processor, since this will make the OS feel more responsive and let you enjoy games on your phone. Our recommended handsets are all quick for their price, but read the full reviews to get the results from our full benchmark tests. To test performance we run a web browser benchmark on each phone, and also a 3D test to see how well a handset can cope with modern games. We play a video on repeat to test each phone’s battery life; some phones will cope with a couple of days away from the mains, but most phones need charging every day. How much smartphone storage do I need? It’s amazing how much storage you can eat through on a phone, with apps and, in particular, games taking up a lot of space. Throw in videos, music and photos, and you’ll probably need more storage than you think. A minimum of 8GB is required if you don’t use a lot of apps and don’t have a lot of photos, but 16GB or 32GB makes more sense. Look out for a phone that have a microSD card slot, as you can cheaply add more storage to your device whenever you need it. Given that some cheap phones have only 4GB of storage, expanding it via this method is likely to be a necessity on some models. Do I need 4G on my smartphone? While all new flagship handsets support 4G (LTE) data for the fastest mobile data speeds, budget handsets often only have 3G. Whether or not that’s important depends on the type of contract you have and how much data you consume. Most people buying a budget handset won’t need 4G, with 3G more than sufficient for every-day tasks, with Wi-Fi at home or in shops, restaurants and hotels supplementing for faster download speeds. How should I buy a smartphone? Budget smartphones are, as you’d expect, cheaper to buy outright than other handsets, with prices starting at around £100. As a result, if you have the cash, we recommend that you buy one SIM-free. You can then find the right SIM-only deal from any network and then sell your phone when you want to upgrade. If you don’t have the cash upfront, you’ll need to go for a contract deal, but these don’t tend to be great value for budget phones. Avoid PAYG phones (unless it’s an own-brand handset made by the network itself), as you’ll end up paying the SIM-free price, but with your phone locked to a network (with the exception of on Three, which doesn’t lock phones).